Jeremy Thiel: Strapped "The Murph"
The Memorial Day CrossFit Challenge is a fitness competition to benefit the Special Operations Warrior Foundation (www.specialops.org). SOWF provides college scholarship grants, not loans, to surviving children of Army, Navy, Air Force and Marine Corps special operations personnel killed in combat or training missions. The SOWF also provides immediate financial assistance to special operations personnel severely wounded in the global war on terror. The SOWF fills an important void as the people who are benefiting from it are George Orwell’s rough men – The ones who are out there at the really sharp end. It is their kids that use this fund and we can think of no one more deserving. If you are not aware the Special Operations community is made up of: Rangers, Green Berets, Navy Seals, Air Force Pararescue Jumpers, USMC Force Recon, etc. These guys have been on the front lines of the war on terror from day one. No matter how you feel about the war these are some of the most dedicated people in the world. You don’t hear much about what they do, and they prefer it that way. These are the true "silient professionals". It is not only time that we say “Thanks” – we must also give them our support. In memory of Navy Lieutenant Michael Murphy, 29, of Patchogue, N.Y. who was killed in Afghanistan June 28th, 2005. 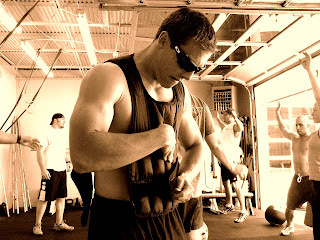 This workout was one of Mike’s favorites and he’d named it ‘Body Armor’. From here on it will be referred to as “Murph” in honor of the focused warrior and great American who wanted nothing more in life than to serve this great country and the beautiful people who make it what it is. The workout is as tough as the warrior so it’s been scaled down into five categories so even mere mortals can participate. The categories are: Elite, Advanced, Intermediate, Novice, and Beginner.